Stellarvue is not just a telescope company. We are a tight group of individuals who are passionate about our industry, products, and the customers who buy them. This group forms the ‘Stellar-family’. Stellarvue is proud of our reputation in the industry, and our name has become synonymous with quality. Because of our high standards, we continue to push ourselves to achieve even greater results. What was great yesterday must be even greater tomorrow. This mindset is shared by every member of our staff, and the results are demonstrated by every product we ship, and every call we take. At Stellarvue, we don’t just want to measure up to a standard, we want to set it. Watch a short video here. We continue to expand our knowledge base and consult with industry experts to better understand the science behind the technology. Our staff is encouraged to take advantage of educational opportunities that benefit their growth and performance. Each member of our team is responsible for reporting project updates and status during open discussions in our innovation center. For the past 20 years, we have contributed to the astronomical community in many ways, promoting scientific education through “Stellartrips” to locations around the world, and other educational programs for our telescope owners. We are also expanding our relationships with institutions of higher learning, and in some cases, develop customized instruments to fit their needs and specifications. Stellarvue is the telescope division of Auburn Precision Optics. Stellarvue is located at 11802 Kemper Road, Auburn, CA. We can be reached at (530) 823-7796, Monday-Friday from 9-5 Pacific time, or by emailing us at mail@stellarvue.com. Every Stellarvue Apochromatic Triplet telescope is tested in three different ways: (1) for optical accuracy using our own Zygo phase-shifting laser interferometer; (2) for optical alignment using an auto-collimator; and (3) for overall performance with a visual star test. Click here for a behind the scenes look at Stellarvue when Sky & Telescope's Dennis DiCicco visits. Optical and mechanical parts are covered by a two-year parts and labor warranty to ensure 100% customer satisfaction. After the two-year warranty has expired, Stellarvue will repair telescopes for a nominal fee. Our Stellar-family customers serve as our ambassadors and we want each of our telescopes operating to original specifications so that owners can be proud of their telescope and excited to show it off. To see customer images, click here. Stellarvue founder and Ace of Space Vic Maris began a lifelong pursuit of astronomy in the mid 1960's, after reading the Golden Book of Astronomy. When recalling his earliest memories of astronomy, Vic said, "My father bought me a 60 mm refractor to encourage my interest in science, but that telescope almost ended my interest in astronomy." 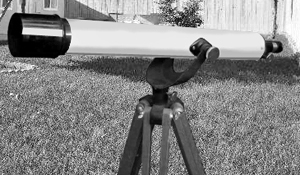 Vic fought the telescope for several nights, with its wobbly base and defective optics. After many attempts, the telescope was retired to his closet. "Far too many telescopes sit unused in closets because companies don't create them with the user in mind. If a telescope is not easy and enjoyable to use, it cannot do what it should; telescopes ought to foster a greater appreciation for the universe." In spite of his first telescope, Vic continued to be interested in the night sky. "The pursuit of astronomy has given me some inspirational experiences. I sincerely appreciate all of those people who helped me along my way.” Vic was also lucky to live in Southern California where some of the best telescope makers could be found and they where willing to mentor him. Vic polished his first 6” mirror and made his first telescope at the age of 14. Two years later, he took on the challenge of making a 5” f-15 refractor at the age of 16. After graduation, Vic excelled in a career working for California State Parks as a ranger and later, a superintendent. He worked for Parks for 30 years, during which time he set up educational star gazing programs and also helped establish the Robert Ferguson Observatory. As Vic neared retirement he taught astronomy for fun in Sacramento, and his students encouraged him to make high-quality, reliable telescopes. With this encouragement, Stellarvue started in Vic's garage back in 1998. Since then the company has grown exponentially and has produced thousands of hand crafted telescopes with exceptional optics. 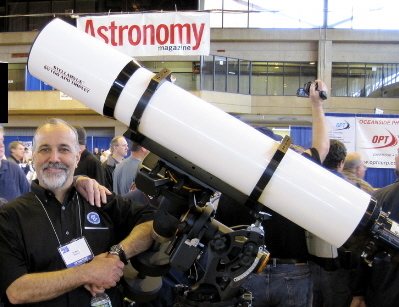 "I have enjoyed introducing thousands of people to astronomy for the past 45 years . Many of these people have purchased a poorly made department store telescope, the nightmare of any budding astronomer. It is unfortunate that most telescopes are poorly made. This is what inspired me to create Stellarvue. This is a small telescope company dedicated to introducing people to the night sky and providing them high-quality, reasonably priced equipment. Our educational programs allow us to share the wonders of the universe with hundreds of like-minded people. This has always been more a labor of love than a commercial endeavor. Anyone who has been truly inspired by the majesty of the night sky knows exactly what I am talking about."